Perfect for sweet white/blush and dessert wines from grape and particularly from country fruits & flowers. The ‘only strain’ for Germanic aromatic white wines. 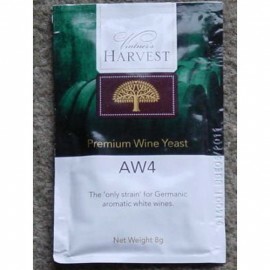 AW4 is noted for developing powerfully fragrant, full, spicy, and aromatic wines. A perfect match for Gewurztraminer; also recommended for Sauvignon Blanc and Semillon where a positive aromatic ester contribution is desired from the yeast. AW4 is a good fermenter across a wide range of temperatures (14 to 30C, or 57-86F), low foam formation, and medium to high glycerol. It will ferment up to 14.5% abv providing the temperature is held within the 20 - 25C (68 -77F) range and the must pH is above 3.0. Suitable with: Flowers, Riesling, Gewurztaminer.